If there is one dish that characterizes Valencia, is the paella, which at the same time is the most widely known of all from Spain. The rice in this province can be prepared in many forms, but the original paella is one that is flavored with chicken, snails and vegetables. Later other variants were adopted, because rice admits almost all ingredients: meats, fish, seafood and vegetables, with only condition that the used ingredients are consistent. 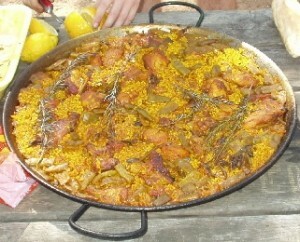 A series of dishes have been derived from the paella, which can be prepared in a similar manner, although in some cases the rice is replaced with another ingredient, for example the fideua. The noodles are frequently used as base ingredient. The rices in casserole or those of cabbage, bouillon, artichokes, pork ribs, etc, are examples of a lot of possibilities for original and always very interesting rice tests that we can find in this province.